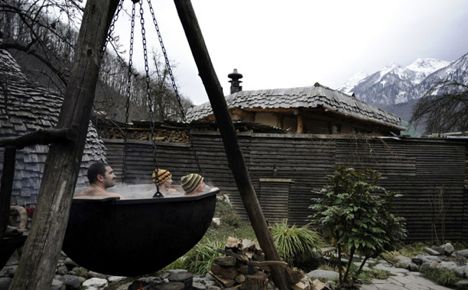 Sochi's Stalin era saunas, sanatoriums, and seawater swimming pools are a great place to de-stress. Joseph Stalin’s favourite resort continues to offer an impressive array of health centers, saunas, sanatoriums and swimming pools to suit any taste. However, in case you do not have time to visit the sanatoriums, bypassing the Russian sauna, or banya, would be a crime. The only type of sauna hotter than the Russian one is the Finnish one (50–70 degrees Celsius), but the Russian is one of the most humid (80–100 percent). Sochi is crossed by the Matsesta River, which boasts healthy waters. The healing properties of the sulfur springs were discovered in the last century, and since then it’s water has been helping people cope with ailments. Not coincidentally, a cup filled with Matsesta water is in the center of Sochi’s official seal. The Matsesta spa is open all year round. It has several unique types of procedures: in addition to sulphur baths, there is an iodine-bromine balneotherapy relying on the local mineral springs. Bathing in mineral-rich warm water has virtually no contraindications, and it has a positive effect on the cardiovascular and nervous systems, increasing the human body’s overall immunity. The more traditional health procedures are also complemented by mud treatment. The Matsesta spa offers plenty of ways to sink from head to toe in choice healing mud that is heated to a comfortable temperature and that contains sulphur, iron, potassium, sodium, magnesium, nitrogen and more. Such a procedure relieves aching joints and makes varicose veins retreat. The cost of a treatment depends on the quantity and types of baths; average prices run between 5,000 ($ 160) and 20,000 ($ 625) rubles. There is a hotline that people can call if they have questions: 8-(800) 200-04-34. The call is free from any Russian phone number. Address: 14 Cheltenkhem Ave., Sochi. The company’s administration is in the Novaya Matsesta district: 4 Cheltenkhem Ave., Sochi.